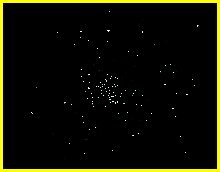 Probably overlooked in favour of M44, M67 is Cancer's second open cluster. About 2250 light years away, it is much further away and also much smaller than M44. It is estimated to be about 10 bilion years old.